A new mystery begins this April as DC Entertainment, Condé Nast and Dynamite Entertainment unite Batman and The Shadow for an epic crossover. Writers Scott Snyder (Batman and All-Star Batman) and Steve Orlando (Midnighter and Apollo, Justice League of America) along with artist Riley Rossmo (Batman, Constantine: The Hellblazer) introduce a new miniseries full of suspense, action and deadly intrigue. In the six issue miniseries, murder has come to Gotham and Batman discovers a trail of evidence that leads to a suspect by the name of Lamont Cranston, however it turns out the man has been dead for over fifty year. As Batman attempts to unravel the enigma surrounding Cranston’s life, but the mysterious Shadow will do everything in his power to stop him from learning too much. 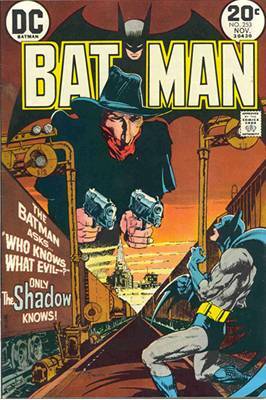 Below is a Batman/The Shadow crossover from an issue published in 1973. Batman/The Shadow #1 from Snyder, Orlando and Rossmo will debut April 26, 2017.